While they’re not the most exciting aspect of your business, your business forms may be the most important! Continuous Business Forms are needed in any business, large or small, to manage accounting and finances. Invoices, order forms, routing slips and statements are used routinely - yet may be costing you time and money! 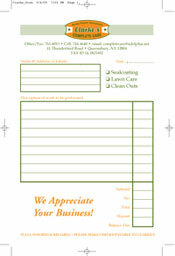 Custom printed business forms can reflect your company logo and serve clients more effectively. The challenge in designing forms is to make a form simple to read, easy to fill out, and more attractive than the template forms you may currently be using. 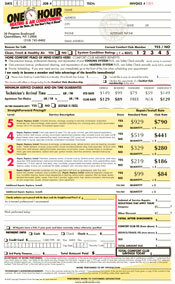 G&S Printing helps countless businesses streamline their form practices by designing and printing custom forms. This prevents mistakes – because you designed them - eliminates the hassles of unwanted formats, looks more professional to your clients, and most importantly saves lots of time and money. G&S Printing provides Carbonless Forms, Carbon Interleaved Forms and Single or Multi-Part Forms, including Superbills, Encounter Forms and Bills of Lading. Unit Set Forms (Hand Written Forms) are a multiple part carbon or carbonless form whose parts are fastened in a common glued stub. G&S Printing provides unit set forms in Carbonless (Stub & Edge Glued), and Carbon Interleaved. All sizes available. Call G&S Printing today – 518-232-2465 - for details on all our Continuous Forms and Unit Sets – and let us help you build the image you need to represent your business and win customers!